In its second year, the Playtime Pad Research Project investigates the effectiveness of tablet-based learning initiatives in early childhood math and reading literacy, while providing access to the latest digital learning tools for students, teachers, and parents. The project is a partnership of Michigan State University, WKAR, PBS and the Lansing School District. 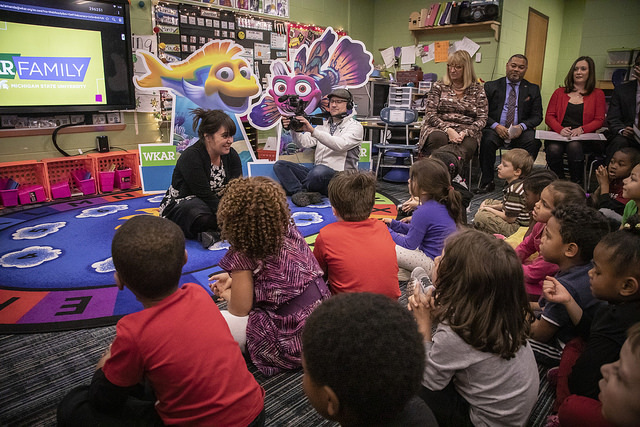 "This is an exciting partnership that brings quality PBS programming to Lansing Kindergartners, through new technology that children love; while strengthening the community connection between MSU, WKAR and the Lansing Schools," said Julie Sochay, WKAR Content and Community Engagement Manager. "We are honored to be working together and look forward to where this project will take us." 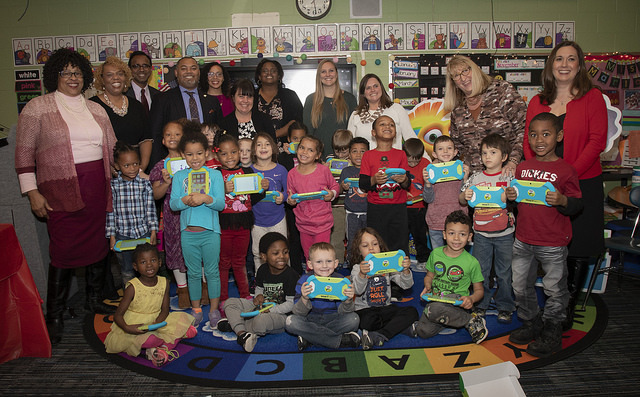 On Wednesday, Nov. 14, 2018, representatives from WKAR TV, MSU and the Lansing School District visited Riddle Elementary School to pass out Playtime Pads to kindergarteners. The students gathered in a classroom to learn about the tablets and the interactive apps, then they walked up one by one to receive their own PBS KIDS Playtime Pad. “This year, we’re going to build upon that content and expand with the iRead app, so that Lansing students are ready for the new state requirements that pertain to third grade reading,” said Associate Professor Amy Parks, Ph.D., from MSU’s College of Education. She said the Playtime Pads include apps and features that can be customized to meet individual student needs. Lansing School Board Secretary Bryan Beverly, Ph.D., said the project offers real benefits to students, while ensuring every kindergartner has access to the latest educational technology. While the research project is still in the early stages, the resulting data will offer insights on how tablet-based learning can be used to improve early childhood education. Parks is leading the initial research phase focusing on math literacy, and Assistant Professor Laura Tortorelli, Ph.D., of the College of Education, is leading research around the iRead app.